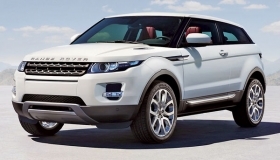 The Range Rover Evoque: U.S. sales begin in fall 2011. LONDON (Bloomberg) -- Land Rover needs to develop greener versions of all its models to sustain sales, the head of Indian owner Tata Motors Ltd. said. The lightweight Range Rover Evoque -- a small, two-door SUV unveiled here Thursday -- must be followed by upgrades of the brand's bigger all-terrain autos producing less carbon, Tata CEO Carl-Peter Forster said in an interview. Tata's Jaguar Land Rover unit is targeting “strong growth” as demand for high- end vehicles rebounds, the CEO said. The Evoque, priced from about 33,000 pounds ($50,000), aims to help lift annual sales to 300,000 units, up more than 50 percent from last year's total. U.S. sales begin in fall 2011. Forster, the former head of General Motors Co. in Europe who took over at Tata in February, cited a new diesel engine to be introduced in the 2011 Range Rover as an example of efforts to bolster the environmental credentials of established models. The eight-cylinder engine delivers 309 brake horsepower, a 15 percent increase, while improving fuel economy to 30.1 mpg, up 18 percent, according to company figures. The Evoque, to be officially launched at the Paris motor show in September, is based on the Land Rover LRX concept car exhibited at the Detroit auto show in January, 2008. Edwards said he expects the company will export about 80 percent of the new models. He declined to give sales targets. The model, developed with 27 million pounds of aid from the British government, will be built in Halewood, near Liverpool, England, where it will create 1,000 jobs. The car will go on sale next summer in two- and four-wheel drive versions and will likely attract drivers that would typically consider buying vehicles such as BMW AG's Mini and Audi's TT, Edwards said at a party in the ground of Kensington palace, celebrating the 40th birthday of the Range Rover brand. Peter Schmidt, managing director of Automotive Industry Data, said Jaguar Land Rover would have been wiser to spend money setting up production of its existing models in China, the world's largest car market. Demand for SUVs will wane with rising gasoline prices, higher taxes on less-efficient vehicles and changes in public sentiment, Schmidt said. The owner of a Range Rover Sport pays 435 pounds in road tax a year in Britain, compared with 245 pounds for a two-liter Audi A6 sedan, according to figures from that country's Society of Motor Manufacturers and Traders. Tata is planning to begin making Jaguar and Land Rover vehicles in China, Forster said in May. The Mumbai-based automaker, India's biggest maker of trucks and buses, bought Jaguar Land Rover from Ford Motor Co. for $2.4 billion in 2008. Tata reported net income of 25.7 billion rupees ($551 million) for the year ended March 31, rebounding from a 25.1 billion-rupee year-earlier loss, as the U.K. unit posted a pretax profit of 32 million pounds.